The Mughal Road, the alternative link between Kashmir and rest of the country, was closed yesterday after the season's first heavy snowfall in higher reaches of Jammu region. JAMMU: The Mughal Road remained closed for vehicular traffic for the second day today as high-altitude areas continue to witness snowfall, resulting in a marked dip in night temperature across Jammu region, officials said. However, day temperature, which plunged six degrees below normal on Friday, registered an improvement with the sun coming out after remaining hidden for the past couple of days. "The road remained closed for vehicular traffic for the second day as the area around Peer Ki Gali witnessed another spell of snowfall during the night," Deputy Superintendent of Police, Traffic, Mohammad Aslam told PTI. He said the department concerned had launched road clearance operation yesterday itself, but its reopening depends on the weather conditions. "If weather permits, the operation to clear the road will be intensified and it will be thrown open to traffic again shortly," Aslam said. Two feet of snow had accumulated on the ground between Peer Ki Gali and Pushana, a 20-km stretch along the Mughal Road connecting Poonch district with south Kashmir’s Shopian district, on Friday night. Sinthan Top along the Kishtwar-Anantnag road recorded over three feet of snow since November 15, the day when over the two-month-long dry spell ended in the state. The minimum temperature in Jammu fell by 1.7 degrees Celsius to settle at 9.5 degrees Celsius – three notches below normal, an MeT office spokesperson said. 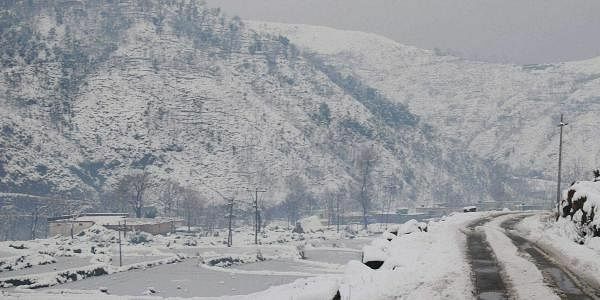 He said night temperature also registered a dip in other places in the region, with Bhaderwah in Doda district, which received the first snowfall of the season yesterday, registering a low of 3 degrees Celsius. The minimum temperature in Katra was 10.8 degrees Celsius, followed by Batote 4.3 degrees Celsius and Banihal 4 degrees Celsius, the spokesperson said. The weatherman has predicted improvement in weather conditions in Jammu region from today.